Jack Fleetwood was one of the original supporters of the Kinsol Trestle and the efforts to preserve it. The following information about Mr. Fleetwood was provided by the Cowichan Valley Museum and Archives. Jack Fleetwood was born on May 19, 1914 at “Achranich,” the family home on Bench Road in Cowichan Station. His father was an Irish Remittanceman, George (Bert) Fleetwood and his Scottish-born wife, Edith. Jack became a well-known local historian, beginning at an early age when he listened to the “old timers” and wrote their stories in a notebook for future reference. Jack was employed by MacMillan Bloedel but he spent the majority of his life being a champion of preserving history and heritage in the Cowichan Valley, and recording the history of the Cowichan Valley. He won a writing prize at the age of ten and wrote for the Cowichan Leader Newspaper from the age of 27 until he died in 1998. His contributions to the heritage-aligned community organizations was prolific and included the Native Sons of BC Prevost Post #10, Baden Powel Guild, Shawnigan Historical Society, BC Folklore Society, the Cowichan Historical Society, the Koksilah Old School Historical Society, the Sylvania School Society, the BC Folklore Society, the Fairbridge Historical Society, and many more. He also donated land and helped develop Bright Angel Park, just south of Duncan. He was also an integral part of the Cowichan Historical Society and, along with others, delighted in the establishment of the Cowichan Valley Museum and Archives. Jack was a much-loved figure in Duncan and is remembered for the enormous contribution he made to local history. 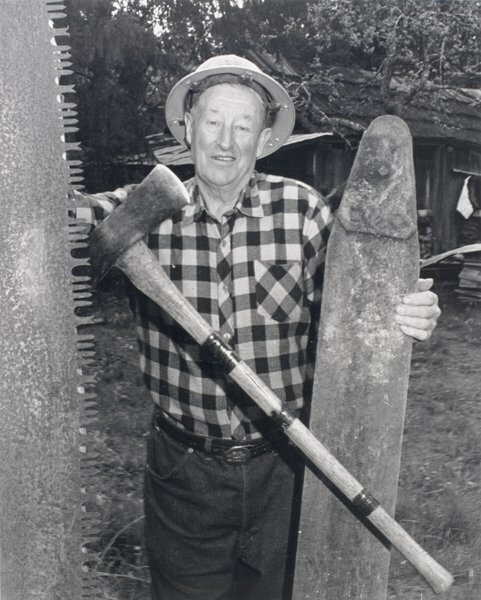 The above photo was likely taken on Jack’s property, depicting some of the tools used during his logging days.